Some of the University of Michigan's most innovative strategies for online learning are based on values held throughout its 200-plus year history. Here, U-M's associate vice provost for academic innovation explains why Michigan Online — a relatively recent initiative — brings communities of motivated learners together, both to learn together and to apply their knowledge to solving significant problems. Working in the Office of Academic Innovation at the University of Michigan-Ann Arbor, James DeVaney helps guide Michigan Online toward realizing two of its most ambitious, related goals: (1) to create an environment that serves those who seek to adopt a "learning lifestyle" — those who can articulate why they are "here to learn" — and (2) to empower communities who wish to learn and create together. CT asked DeVaney about the potential of Michigan Online to offer new, innovative learning experiences that break new ground in online programs while supporting U-M's strongest and longest-held values for learning. Mary Grush: As associate vice provost for academic innovation, what is your vision for Michigan Online? 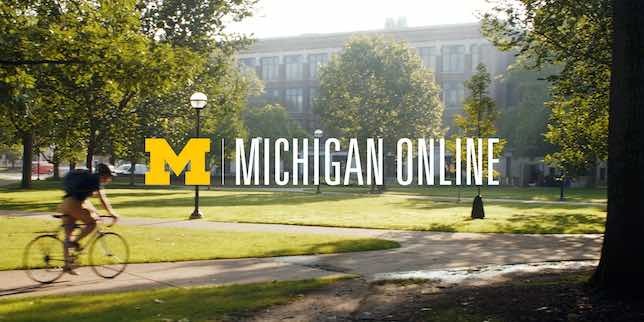 Does Michigan Online differentiate itself from online programs commonly offered at other institutions? How? James DeVaney: A significant part of our institution's mission is to develop leaders and citizens who are equipped to challenge the present and enrich the future. Last year, we celebrated our bicentennial and engaged in an important campus-wide conversation. This unifying discussion led us to recommit to this mission and rediscover a particular opportunity and responsibility. Namely, as a great public research university with incredible breadth of excellence and one of the largest active alumni networks, we are uniquely positioned to help address some of society's most important problems. Looking ahead to our institution's third century, our president and provost have effectively led our community to frame our shared values at the intersection of academic innovation; diversity, equity, and inclusion; and public engagement. Innovation, inclusion, and public purpose have long guided our community to seek excellence in the pursuit of new knowledge. It is at this intersection, and in light of our birthday reflections, that we established Michigan Online. In a world of near-limitless access to knowledge, and learning tools that are improving every day, we have decided that increasing access to learning opportunities is not enough. To create a peaceful, equitable, and empowered society, Michigan Online must provide opportunities to learn together. As Michigan Online moves from infancy, learners will discover that we are not simply scaling content, courses, or curriculum, but rather, we are scaling communities for learning. And communities of learning supported by Michigan Online will center on solving the societal problems that matter most. Like many who are familiar with the concept of the sixty-year curriculum, we see learning lifestyles as essential and a departure from an expiring definition of lifelong learning as enrichment or optional episodic re-skilling reserved for the relative few who are privileged to stay at the head of the class. 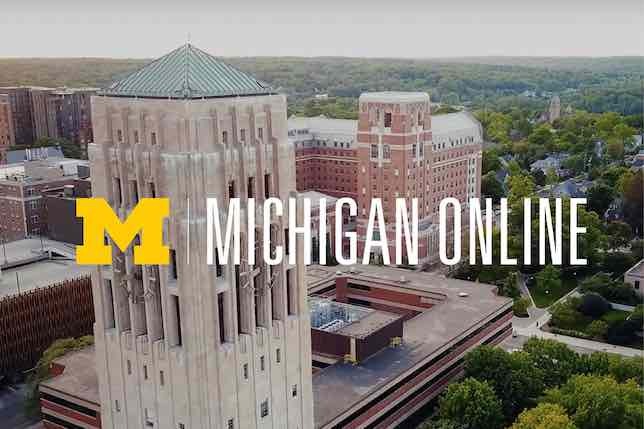 Michigan Online exists to broaden the impact of our mission by making our elite public research university's learning experiences accessible at scale. But whereas many seemingly similar initiatives organize around a collection of learning products, we see the facilitation of global problem solving communities as our primary contribution. Society provides us with no shortage of complex problems. Problems of great magnitude require engagement from learners at all levels and multidirectional learning opportunities that place value on expertise from inside and also well beyond the academy. With Michigan Online, I imagine a future where diverse communities of intergenerational, interdisciplinary, and interprofessional learners engage in solving the most important societal problems. Participants in these problem solving communities will certainly access the evolving mix of formal and flexible learning opportunities we know today on a spectrum from bootcamp to degree. More importantly though, they will engage deeply in problem solving communities consisting of a range of action-oriented engagements with learners eager to solve problems that matter. Grush: What goals help guide Michigan Online? Who on campus inspired those goals, and who has set them into motion? DeVaney: The goals that guide Michigan Online may appear born of the information age but in fact they have always been a part of Michigan's saga. Former U-M President Henry Tappan posed the following in his 1852 inaugural address: "Is it not rather our doctrine, that a free people cannot know too much, and that the more we know, the more strongly shall we lay hold upon freedom? The clearer, the more perfect the element of light, the better we shall see." Michigan Online helps people acquire new knowledge and puts them in a position to use it. Michigan Online helps people acquire new knowledge and puts them in a position to use it. Former U-M President James Duderstadt, who led the university in the late 1980s through the mid-1990s, anticipated a shift in our third century where we would make choices to "align U-M to better engage with a world dependent upon learning, knowledge, creativity, and innovation". Michigan Online expands our public purpose to support learners everywhere. More recently, U-M's President Mark Schlissel addressed our campus community last last year during our bicentennial and provided an important call to action: "I believe the social contract between institutions of higher education and the public we serve is up for renewal and it's up to us to shape that contract going forward." Michigan Online creates new opportunities for learners around the world to engage with Michigan and for Michigan to engage with the world. While we've benefited from consistent forward thinking and progressive leadership from the top, our community is anything but top down. Inspired by 200 years of commitment to delivering an uncommon education to the common person, we created Michigan Online to broaden the impact of U-M's mission — as I stated earlier — to develop leaders and citizens who challenge the present and enrich the future. Our entire campus community, past and present, inspired the goals that guide Michigan Online. We now imagine a future where compassion is essential to problem solving and discovery. In Michigan Online we see the potential to create a compassionate public square where creativity, comprehensive academic excellence, and our aspirations for societal impact all come together for individuals prepared to adopt a learning lifestyle and communities who hope to learn and shape the world together. Grush: What are some examples of success in Michigan Online's program offerings and strategy? It's still early, but what can you point to so far? DeVaney: We are excited by signs of success in several areas after officially launching Michigan Online last month. Groups of learners on campus are forming learning communities to personalize their experiences and create opportunities for social learning. Educators are leveraging open content to enhance learning experiences at other universities, community colleges, and community organizations. Alumni are seeking new skills and sharing ideas for future learning opportunities. Public learners are contributing to new knowledge creation through Teach-Outs. We are seeing an increased appetite from our schools and faculty to engage in new interdisciplinary courses and programs. We also see broader public awareness of the integral role of U-M in facilitating conversation around some of today's most important societal challenges and elevating the voices of the underserved. Grush: How will individuals and communities shape the nature of Michigan Online going forward? DeVaney: Individuals and communities will suggest new learning experiences, co-create courses, and offer their expertise through formal and informal teaching and mentoring. We will scale initiatives like our Mentor Academy to create opportunities for communities to learn together. Michigan Online represents the connective tissue by which individuals and communities remain intimately connected to U-M in all arenas of life, and ultimately they are empowered to create and dictate the nature of that relationship. We have opened up our work to allow for learners to play an active role in defining what Michigan Online is today and what it can be in the future. Grush: What are Teach-Outs, and how do they impact Michigan Online? DeVaney: We created the Teach-Out model in order to enable conversations across geographic boundaries, around some of today's most complex problems. Teach-Outs are events that bring together the public and experts from across domains to learn from one another and create a richer understanding of these timely issues. 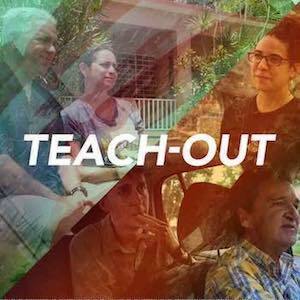 Since establishing the Teach-Out model and series in March 2017, we have produced 21 Teach-Outs and engaged more than 77,000 participants in conversation on topics ranging from the opioid epidemic to Internet privacy to exploring universal basic income. In addition to launching the Teach-Out series, we developed and hosted our inaugural Teach-Out Academy in Spring 2018, hosting ten peer institutions in Ann Arbor in order to share this approach to innovative multidirectional public engagement. It's important to note that Teach-Outs transform from events to open educational resources after an event is complete. We are building out an archive of all Teach-Outs on Michigan Online so that educators and lifelong learners can draw from the rich set of resources to raise awareness and motivate informed citizen engagement in their own communities. Because we are opening these resources to the world through Michigan Online at no cost, universities, community colleges, community organizations, and senior centers have already begun to utilize teach-out resources to enhance learning and conversation in other domains. From the beginning, we hoped other universities would take the torch and share the light of learning through their own teach-outs. We were thrilled to partner with the University of Notre Dame, to launch a Teach-Out in August and September to raise awareness about Puerto Rico and the impact of Hurricane Maria, and to promote action from the public. We're excited that our friends at the University of Leiden are launching a Teach-Out later this month focusing on global human rights. As we build a future learning environment designed around dynamic problem solving communities, Teach-Outs provide important entry points for learners at all levels to find their own pathways to problem solving. In addition to making the Teach-Out archive accessible through Michigan Online, we will continue to launch at least one Teach-Out per month. As we build a future learning environment designed around dynamic problem solving communities, Teach-Outs provide important entry points for learners at all levels to find their own pathways to problem solving. To effectively solve global problems, I believe we need to create a compassionate public square for the information age. Through the Teach-Out Series and Michigan Online we are creating a vehicle designed to help everyone to participate in shaping our preferred future. Grush: Do you see Michigan Online as a model for education transformation that can serve higher education more generally? When will we see some changes or impacts that stem from Michigan Online's recent innovations? DeVaney: The growth of digital education now further enhances our ability to engage learners on campus and across the globe. But the renaissance we have entered is often conflated with tech disruption. It is only possible for U-M to enter a transformational period because we have stayed committed to our institutional values for two centuries. With this foundation and unwavering commitment to progressive higher education and social impact, we can accelerate our drive toward innovation, inclusion, and public purpose. We will always seek new ways to engage learners from all economic circumstances and all levels of learning to engage in discovery. With Michigan Online we will remove obstacles of time and space to connect the amazing network of learners that seek to engage with each other to develop new skills, acquire new knowledge, and apply those skills and knowledge to solve problems. We are already seeing the impacts that result from openness and inclusivity. Peer institutions are adopting our Teach-Out model and building participatory and inclusive models for public engagement that accelerate the construction and sharing of new knowledge. Before the end of the year we will surpass 7 million MOOC enrollments. Many of these learners are discovering pathways to programs and learning communities thus strengthening our flexible and networked model for global and lifelong learning. Peer institutions are adopting edtech tools developed by our team, allowing these institutions to create personalized, rigorous, and inclusive models for residential, hybrid, and online learning. We will soon make these tools available through Michigan Online. Pre-college learners and partners are adopting our open courses leading to broadened access and enhanced participation in higher education. It is in our DNA to share our plans, our progress, and our pitfalls along the way. Through transparency our hope is to increase the likelihood that other institutions will benefit and we will see impact more generally across the higher education landscape. Grush: If you had one wish, what would be the most important impact you'd like to see from all your work with Michigan Online? DeVaney: This is simple. We'll create a sustainable model for facilitating inclusive problem solving communities. We'll create a compassionate public square that inspires people to learn together, from each other, and in the interest of solving problems that stand in the way of our preferred future.